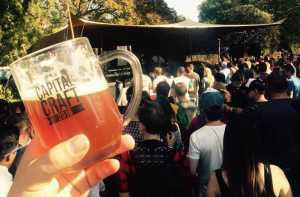 It’s time for the 7th Capital Craft Beer Festival where over 40 brewers will offer their best brew. 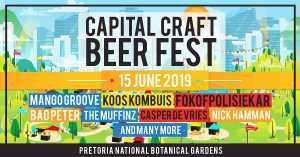 This year’s event is on Saturday 15 June, 2019 at the Pretoria National Botanical Gardens. Mango Groove, Fokofpolisiekar, The Muffinz Music, Koos Kombuis, Bad Peter, Casper de Vries, Nick Hamman, Schalk Bezuidenhout, Joey Rasdien, The Black Cat Bones, Lihle Msimang, Chris Forrest, Alfred Adriaan, Deon Bakkes & the Stolen Horses, Hannes Brümmer, Robby Collins, Nqoba “King Nqoba” Ngcobo, Little Ringo, Thabiso Mhlongo, The Honeymooners Band, Claudine Ulman, Richleua Beaunoir and Zebra. Clamber Club is an extensive and exciting sensory motor programme that gets children moving, promoting fitness, health and learning. There’ll be a Clamber Club Obstacle Course and colourful equipment will be set-up at the Capital Craft Beer Festival Kiddies Entertainment area, offering a safe, active place for your 2-12 year old kids to enjoy the outing. Taxify and Uber Uber. There’ll be a taxi drop of zone. Promo codes still to be revealed. There’ll also be free busses from the Hatfield Gautrain Station to the venue and back all day. Bus schedule to be announced. All parking is R20 and will be safe! Note: No kids between 13 and 17 allowed.